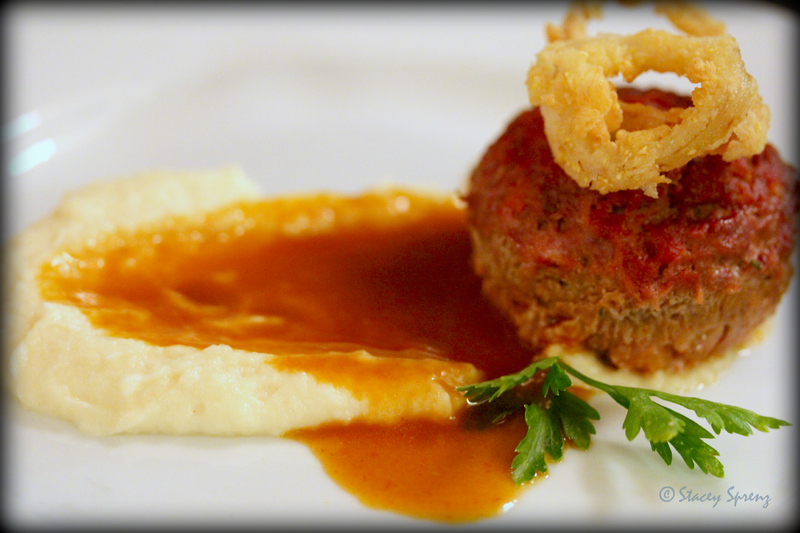 I was honored to be a media judge for the recent Competition Dining Series Quarterfinals of Fire in the Triangle. Chef Adam Jones from Dean’s Seafood Grill & Bar and Chef Serge Flacoz-Vigne from 518 West were the competitors for this round. The event took place at 1705 Prime, one of the venues for Rocky Top Catering. It was apparent that much thought and detail went in to planning this event. From the initial greeting to the vast multimedia platform in the dining room—I could tell this was going to be a memorable night. There was palpable electricity in the air. Because this was a quarterfinal, the chefs competing had already been pitted against other area chefs within the last month. Their victories, although short lived, were a definite sign that the courses would be creative and delicious. I had the pleasure of sitting at the judge’s table with Chef Colin Bedford from the Fearrington House Restaurant, Stephanie Nikolic, the executive pastry chef from Urban Food Group, and Chef Tom Dyrness from Mama Ricotta’s Restaurant in Charlotte. The conversations alone made for an amazing night. Listening to these chefs talk about their personal journeys to this point in time was enlightening. Their expert opinions of the courses presented were a feast for the ears. The secret ingredients were revealed moments before the first course arrived. My favorite piece of the Competition Dining Series is the fact that the secret ingredients are always local—caught, raised, grown, made—right here in North Carolina. Drum roll please… The night’s secret ingredients were: Kerala Curry Tomato Chutney, Mango Chutney, and Vindaloo Curry (made in Pittsboro, NC) and labneh from Hillsborough Cheese Company. I nearly burst with excitement, as these are two companies that I love dearly! The room was a buzz with anticipation of the courses to come. Judging a competition like this can be a daunting task, but Competition Dining Series creators provided us with criteria and a smartphone app for voting. 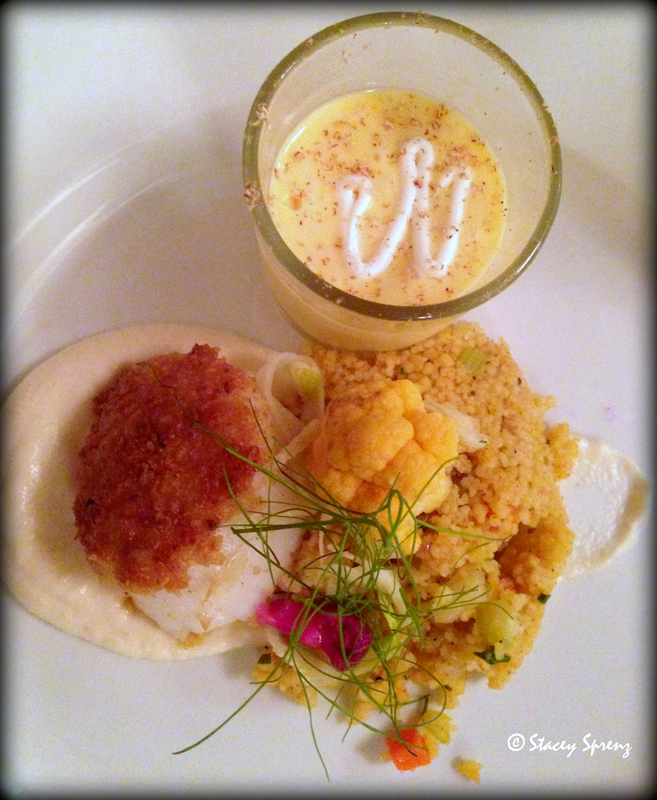 Each course is scored in eight areas including Presentation, Aroma, Overall Flavor, Flavor of Secret Ingredient, Execution, Creativity, Use of Secret Ingredient, and Accompaniments. Votes may be changed throughout the night as courses continue to arrive, but must be locked in at the end of the evening. Participants vote as well, so at the end of the night everyone gets to see how the audience voted and how the judges voted. This makes for some cheering…and good-natured booing! A picture is worth a thousand words (or more), so I will let you feast your eyes on the creativity of these two chefs in the photos below. The winner of the night, Serge Falcoz-Vigne of 518 West, will compete again in the Semifinals on July 29th. Competition Dining Series wraps up in the Triangle soon, but Fire in the City starts in August and Final Fire will be held in November. If you can’t make it to an event—and I highly recommend you try—catch all of the photos and excitement on the Competition Dining Twitter feed and Facebook page. Let the games begin! I love a wine paired with an amazing meal. I also enjoy using wine in my cooking. It is a diverse indulgence and the perfect ingredient. 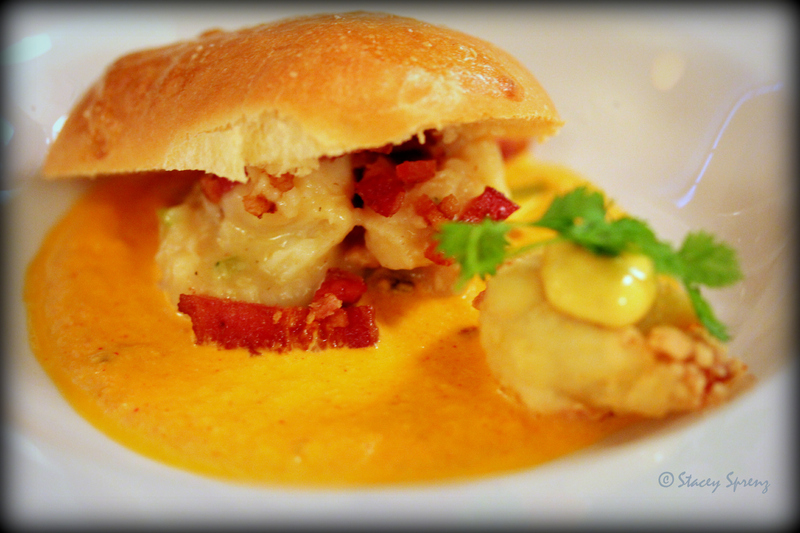 When it comes to wine and food—well, they just go together in perfect harmony. 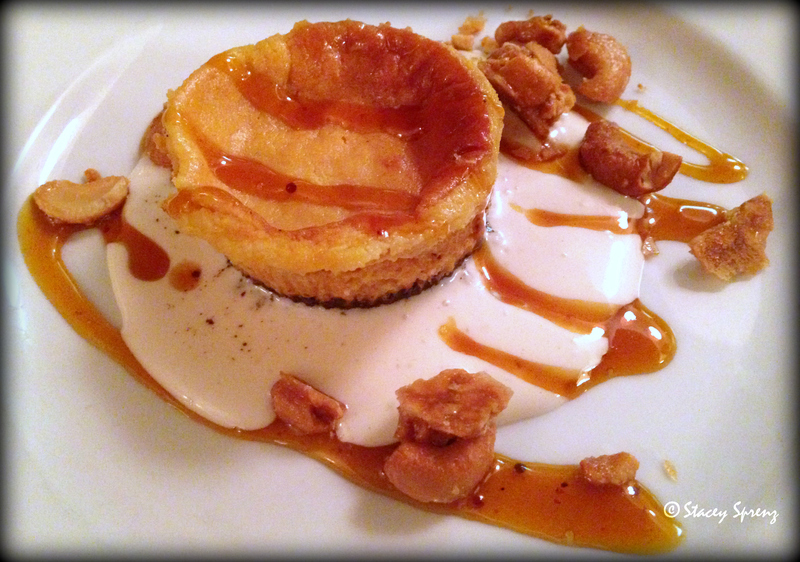 So naturally, a dessert with wine in it peaks my interest. 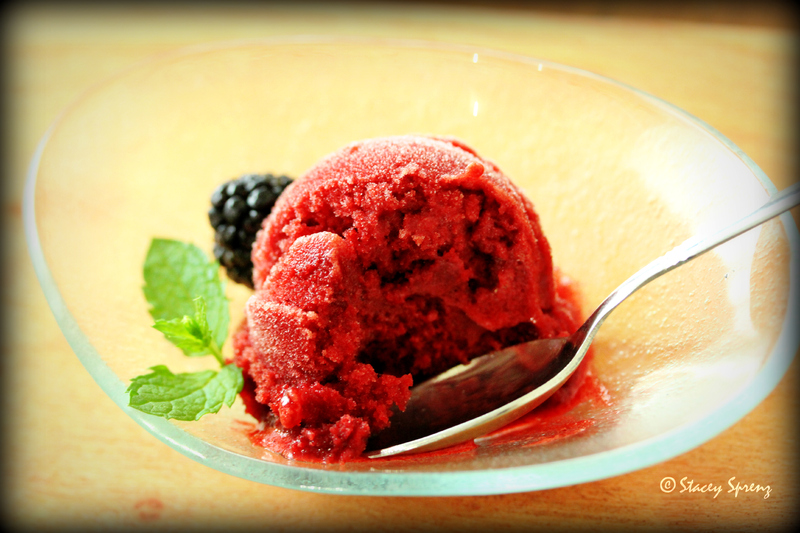 After the fruit sherbets earlier in the summer, I decided to lighten things up with a sorbet. 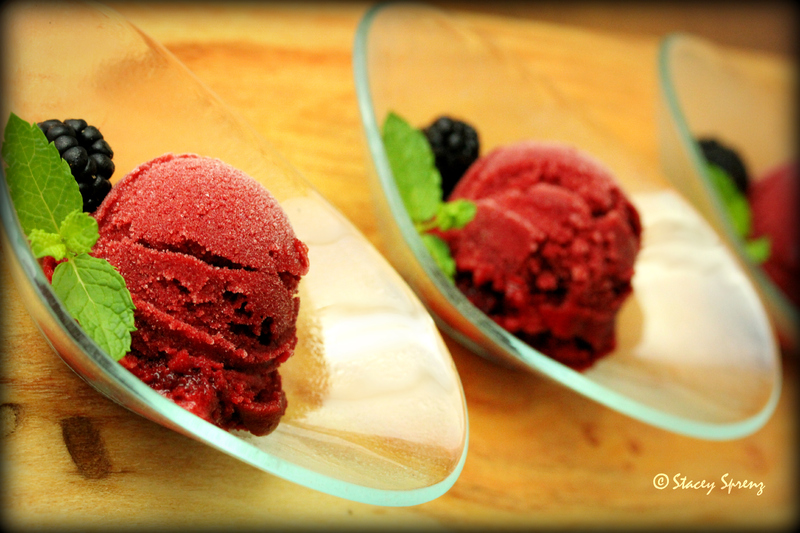 Sorbet has a palate-cleansing characteristic that makes it the perfect end to a summer meal. 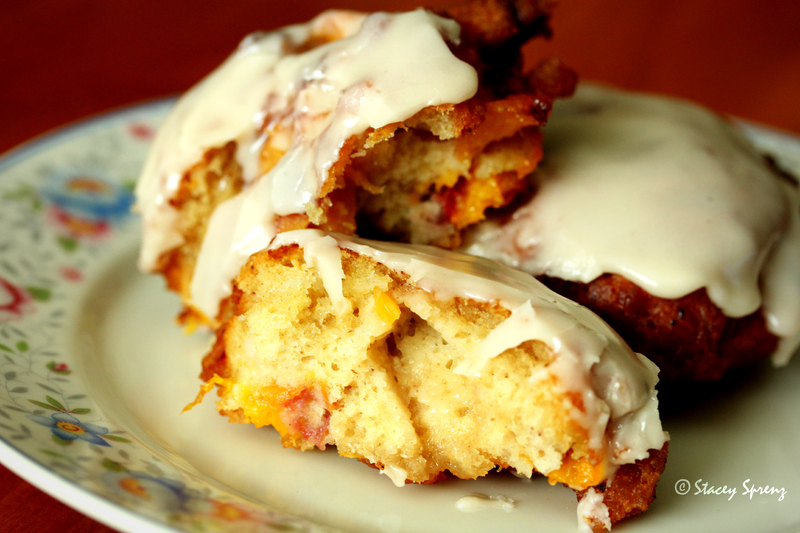 It’s not too sweet and has a refreshing tang that gives your taste buds a wake up call. 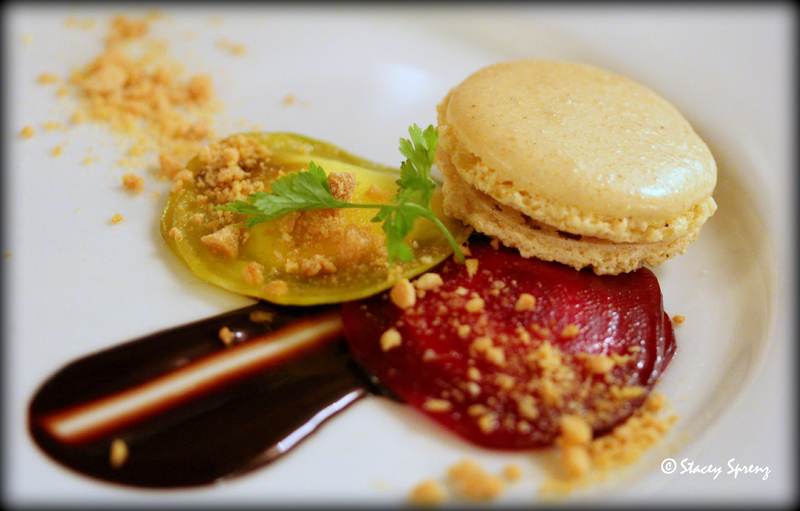 With the abundance of summer fruits and access to a variety of wines, it is fun to create delectable pairings. Blackberries and Zinfandel? Yes, please! Peaches and Reisling? That could work! The possibilities are endless. The bounty of blackberries at the farmers markets right now, made it easy to focus in on the first recipe. We often hear bold red wines described with notes of blackberry, plum, and cherry. These notes provide a wonderful hint as to which wines to pair with which fruits. The same is true for the white wines with their citrus and pear notes. A little fruit, some sugar, some wine…and you have an amazing dessert that will have you sneaking back to the freezer for more! Puree the blackberries with the sugar in a food processor or blender. Pour mixture into a saucepan and heat over medium until it begins to simmer. Remove from heat promptly. Strain mixture by pushing it through a sieve. This should yield about 2-3 cups of syrup. 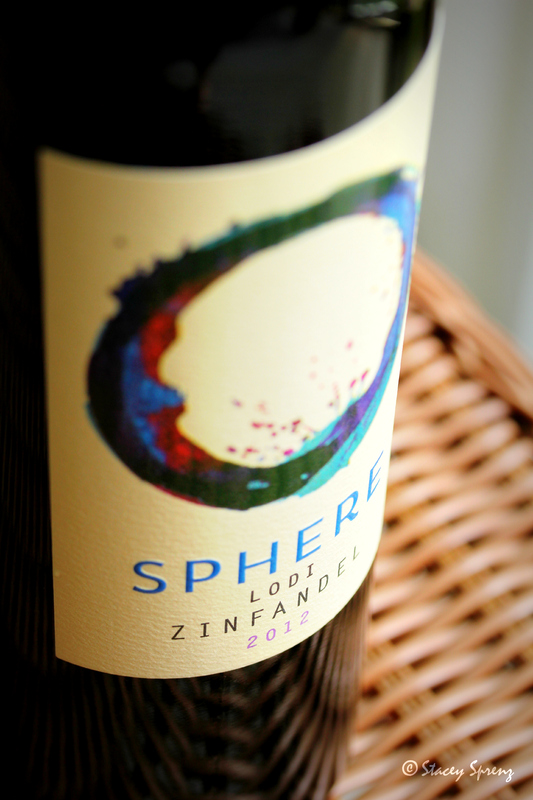 Stir in the Zinfandel and chill for 4-5 hours. Process mixture in an ice cream maker until soft serve consistency. Place in a container and freeze. My love of farmers markets runs deep. As a child, I remember visiting the City Market in Kansas City, Missouri with my dad. It was a feast for the eyes—brightly colored vegetables piled high on tables, stacks of perfectly shaped eggs in cartons, golden bottles of honey lined up like soldiers. It was always a treat to go to the farmers market. My dad navigated the stalls like a pro with me trailing behind in an awkward stumble as I tried to take it all in. These cherished visits left an indelible mark on me. I get that same childhood thrill when I step out of the car for my Saturday morning market visit. I want to state for the record that I do not have a favorite market. People often ask me this question. I love different markets for different reasons. I have lived in North Carolina most of my adult life, thus the bounty of the seasons here is familiar and comfortable. I have visited markets in New York City and throughout California, too. Each market has it’s own personality and vibe. 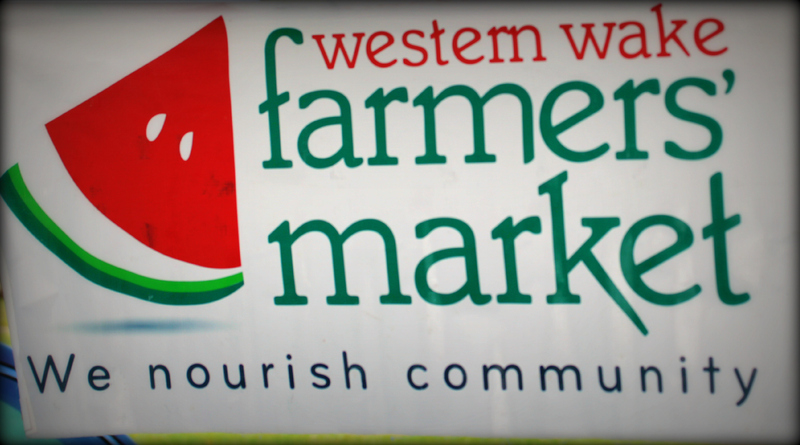 One market I visit often is the Western Wake Farmers Market. I love the variety of produce and products that they offer so close to home. 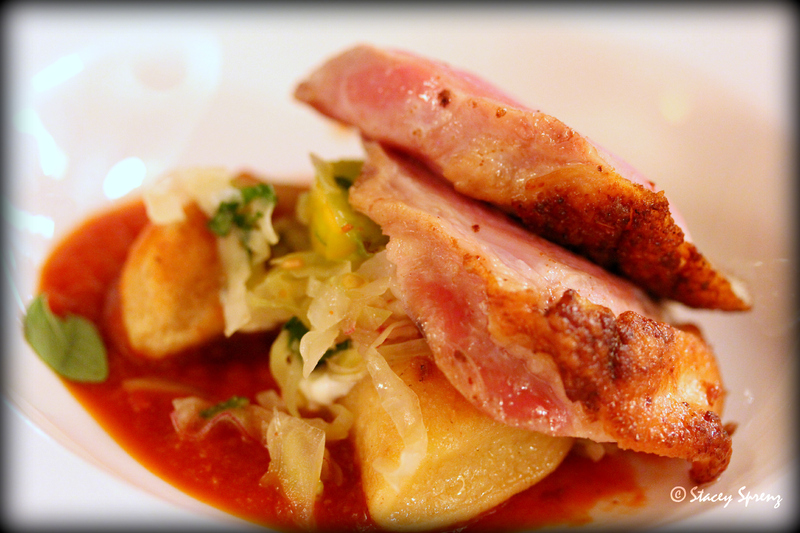 The abundance of pastured meats, local artisan cheese, local produce, coffee, pasta—and much more—keeps me coming back! 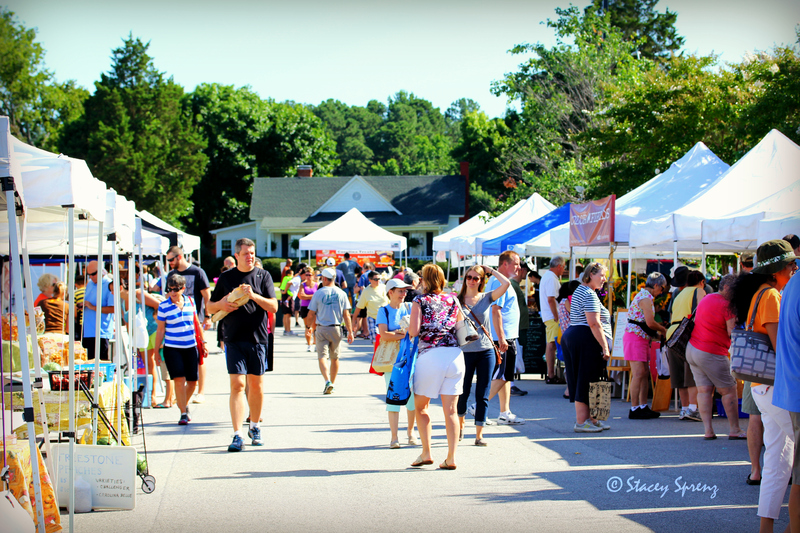 Western Wake Farmers Market also hosts special events to celebrate the produce of the season. Summer is the celebration of the peach. North Carolina peach growers provide us with some sweet, juicy fruit that has me thinking of cobbler, ice cream, and preserves with each luscious bite. 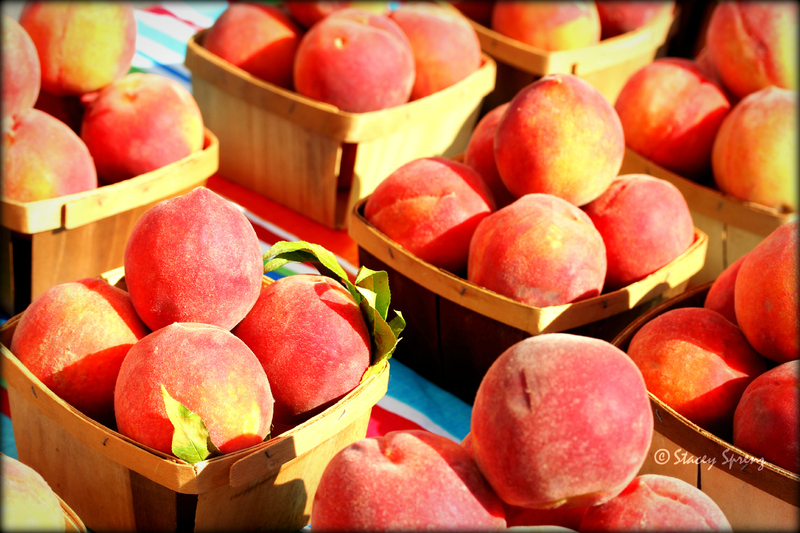 To applaud this local summertime treat, Western Wake Farmers Market is hosting their annual Peach Day on Saturday, July 12th from 8:00 a.m. to noon. In addition to the regular market fare, they will have samples, recipes, and chef demonstrations. Check out the details below! Well, I know where I will be Saturday morning—at Western Wake Farmers Market getting more peaches to make my peach fritters, and maybe a cobbler…or two. I hope to see you there! 1. In a bowl, mix together the flour, brown sugar, and spices. 2. Add the eggs and buttermilk. Stir until mixture forms a wet batter. 3. Add the diced peaches and mix to combine thoroughly. 4. In a large saucepan or small Dutch oven, heat the oil to 375°F. 5. Using a medium sized cookie scoop, place batter into the oil. Do not put more than 4 in the oil at a time to ensure even cooking. 6. Allow fritter to fry for about 1-2 minutes. Using a spatula, gently press down on the top of the fritter to flatten slightly. This helps the inside of the fritter cook more evenly. Turn the fritter and continue to fry for another 3-5 minutes. 7. Once fritter is golden brown on both sides, remove to a cooling rack. 8. Prepare the glaze by sifting the powdered sugar into a bowl and adding the buttermilk and vanilla extract. Mix to combine ingredients. 9. Once fritters have cooled slightly, spoon 1-2 tbs. 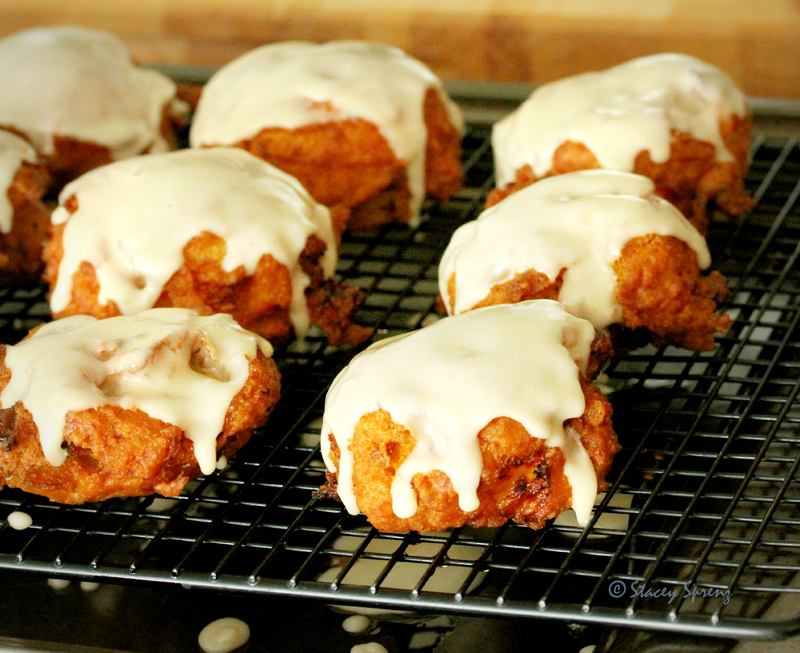 of the glaze over each fritter. It seems that the theme for my culinary life during the summer is: What to do with all this abundance? I am speaking of farmer’s market abundance, of course. Some items are short-lived in the spring, and we almost cry when they disappear from the market tables: strawberries, tender lettuce, peas, scapes, and asparagus to name a few. We just cannot get enough, and then…they are gone. Soon, the tomatoes make an entrance, mounds of green beans appear, and the peppers are piled high. I start to get excited about all of those Caprese salads I will be inhaling—fresh mozzarella, homegrown basil, olive oil from Olive Wagon—I feel giddy! What about the green beans and peppers? A girl cannot live on Caprese salad alone. Or could she? 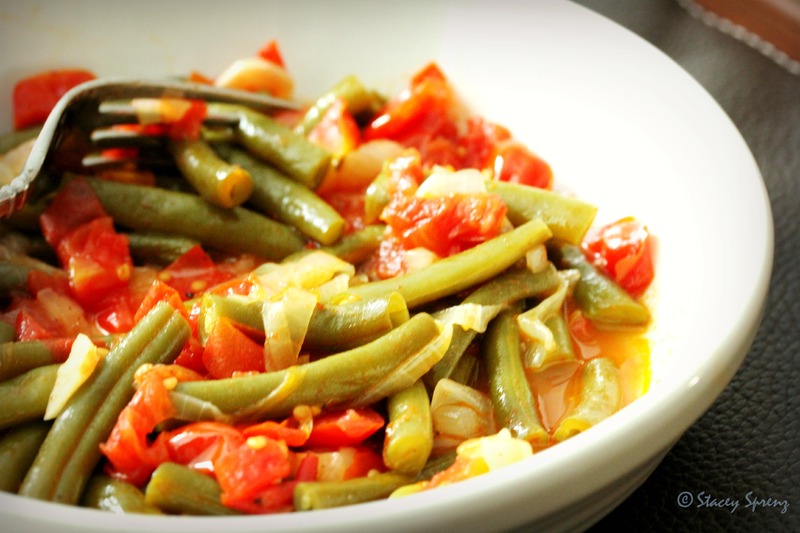 Let’s talk green beans—so plentiful, so green, so basic—they beg to be with the tomatoes. 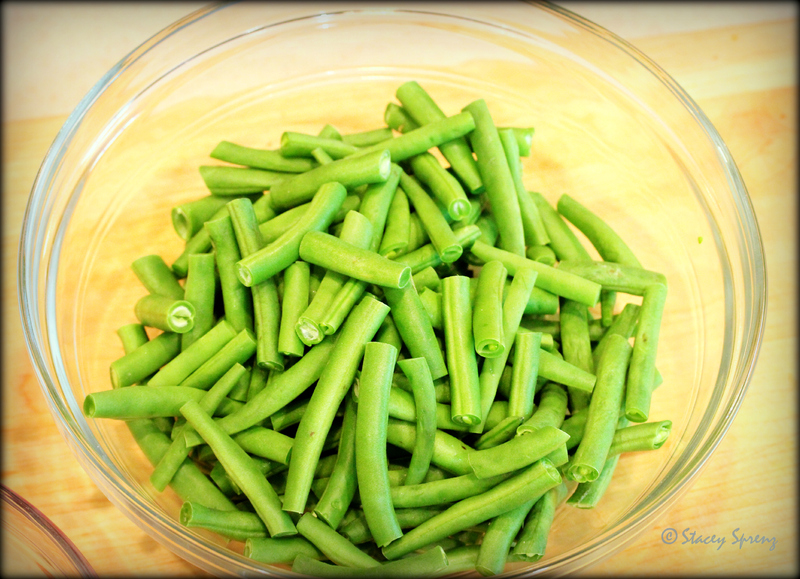 Green beans are somewhat alkaline so they do well with the acidity of a tomato or a little vinaigrette. 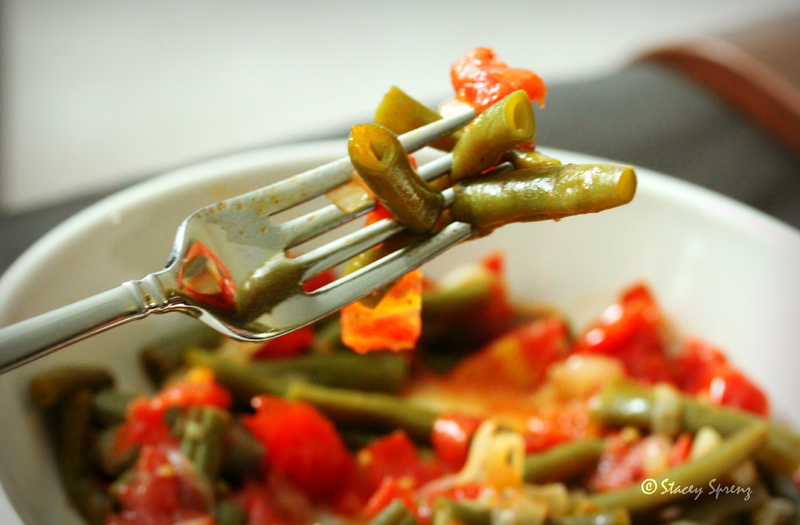 Green beans are forgiving, too. They can be eaten blanched and sautéed (still crisp) or stewed until they are delicately tender. If you are accustomed to the green beans you pour into a saucepan out of the can, I urge you to put down the can and get some fresh beans at your local farmer’s market. Try this recipe and see if you ever go back to canned beans again. I doubt it. 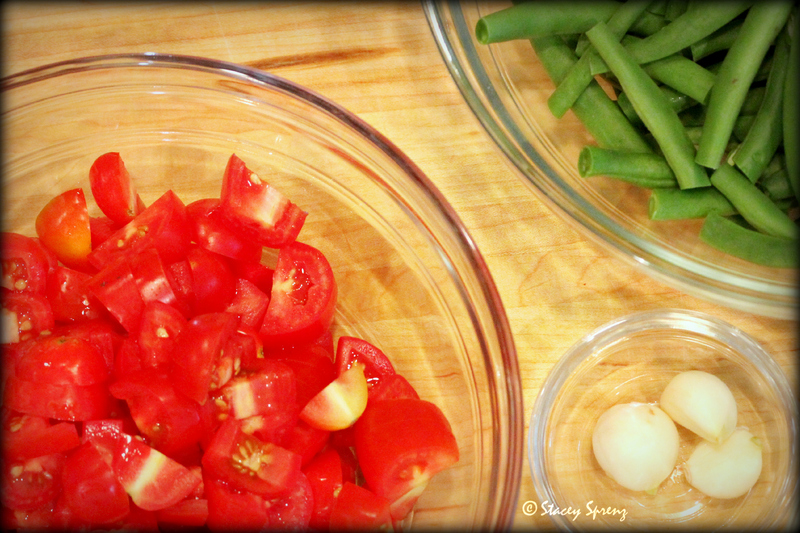 Prep your green beans, onion, and garlic. Cut the cherry tomatoes in half (or chop the Roma tomatoes). In a heavy cast iron pot with a lid, heat the olive oil on medium heat. Add the onion and sauté for about 4-5 minutes until translucent and softened. Add the garlic and continue to sauté for about 2 minutes. Add the tomatoes, honey, and red pepper. Stir to combine ingredients. Continue to cook for about 1 minute. Add the green beans and continue to cook for about 2 minutes, stirring occasionally. Add the wine. Stir to incorporate the ingredients and turn the heat down to Low. Place the lid on the pot and let simmer for about 40-45 minutes. Stir in the cinnamon, salt, and pepper. * If you don’t have a heavy cast iron pot, use a sauté pan or stockpot with a lid. Chop or puree the roasted garlic cloves. Thoroughly combine the garlic, butter and salt. Grate or slice the cheese of your choice. Spread the mixture on the bread slices and top with the cheese. Place under a broiler for a few minutes until cheese is bubbly.